This is fantastic for a potluck or a summer lunch. Speed preparation by buying pre-shredded cabbage. Section oranges over a small bowl, reserving juice. Halve sections, if desired. Toss sliced bananas in orange juice, drain. 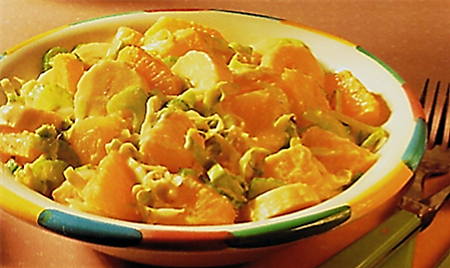 In a large mixing bowl combine orange sections, sliced banana, pineapple, cabbage, and celery. Add yogurt; toss lightly to coat. Serve immediately or cover and chill up to 3 hours. Serves 8 to 10.